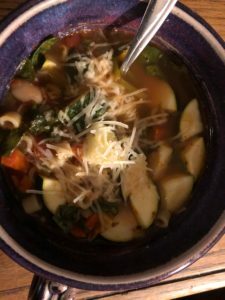 One of my favorite things about this soup is that you can use whatever vegetables you happen to have. I have written the original recipe below, but if you don’t have one particular vegetable- don’t worry! Substitute it for something else you do have. Since it is no longer summer, we no longer have summer squash, but we substituted it for delicata squash and it was delicious. In a medium bowl, cover the beans with cold water by several inches and stir in 1-tablespoon salt. Let beans soak at least 12 hours and up to a day. Drain and rinse. Combine beans, onion halves, carrot, celery, garlic cloves, rosemary, parsley, and bay leaf in a large pot and cover with water by several inches. Add a pinch of salt. Bring to a boil; reduce to a simmer, and cook, topping up with water as necessary, until beans are fully tender, about 45 minutes. Using tongs, discard the vegetables and herbs. Drain beans, reserving the liquid. Transfer bean-cooking liquid to a 2-quart measuring cup and add enough cold water to equal 2 full quarts (8 cups). Heat pancetta (if using) and olive oil in a large Dutch oven or stockpot over medium-high heat. Cook, stirring, until pancetta has rendered fat and softened, but has not yet browned. (If omitting pancetta, heat oil until it is shimmering.) Add onion, carrots, celery, and minced rosemary. Season with a big pinch of salt and cook, stirring, until vegetables are softened, but not brown, 10 to 15 minutes, adding oil if the pot appears dry or the vegetables start sticking to the bottom. Add the garlic and cook, stirring, until fragrant, about 30 seconds. Add tomatoes and cook, stirring, until most of the moisture has evaporated and the mixture starts to fry. Add reserved bean-cooking liquid, beans, and Parmesan rind (if using). Let broth simmer for at least ten minutes. Add pasta (unless you are planning on simmering for a long time; see below), zucchini, squash, and green beans, and simmer until pasta and vegetables are tender, about ten minutes. Add spinach and cook, stirring occasionally, until spinach is wilted, about 5 minutes. Discard Parmesan rind if using. Serve soup immediately as is, or continue simmering for up to 2.5 hours for a heartier texture and flavor (if simmering for a long time, add the pasta 10 to 15 minutes before serving). Stir in chopped herbs and season with salt and pepper to taste before serving.